The building has a roof height of 1,250 feet (380 meters), and with its antenna (which was installed in 1950), it has a height of 1,454 feet (443.2 meters). It was the tallest building in the world for nearly four decades, and it’s still the 28th tallest in the world and the fifth tallest in the U.S. today. How Many Floors Is the Empire State Building? There are 102 Empire State Building floors. It was the first building to have more than 100 floors. The 86th floor is the location of its world-famous observation deck. How Many Steps Are in the Empire State Building? The Empire State Building has 1,860 steps from the street to the 102nd floor; 1,576 steps make up the 86 flights to the observation deck. Runners attempt to scale all of these 1,576 stairs in the yearly run-up challenge. There are 73 elevators in the Empire State Building. It also has eight high-speed escalators connecting the first and second floors. What Is the Empire State Building Address? It is located at 20 W. 24th Street, New York, NY. Check out the official map and directions if you want to stop by. Another fun fact is that the building has its own ZIP code: 10118. The Empire State Building timeline shows that this art deco masterpiece has had an amazing, sometimes hauntingly dangerous and deadly history. 1928: The Bethlehem Engineering Corporation bids on the location: the old Waldolf-Astoria Hotel. The company originally intended to build a 25-story office building, but it was later expanded to 50, then 80 stories due to the intense competition to have the world’s tallest building, known as the “Race for the Sky,” with 40 Wall Street and the Chrysler Building being its main competitors. The designers at Shreve, Lamb, and Harmon create the now-iconic art deco design, William Lamb being the lead designer. 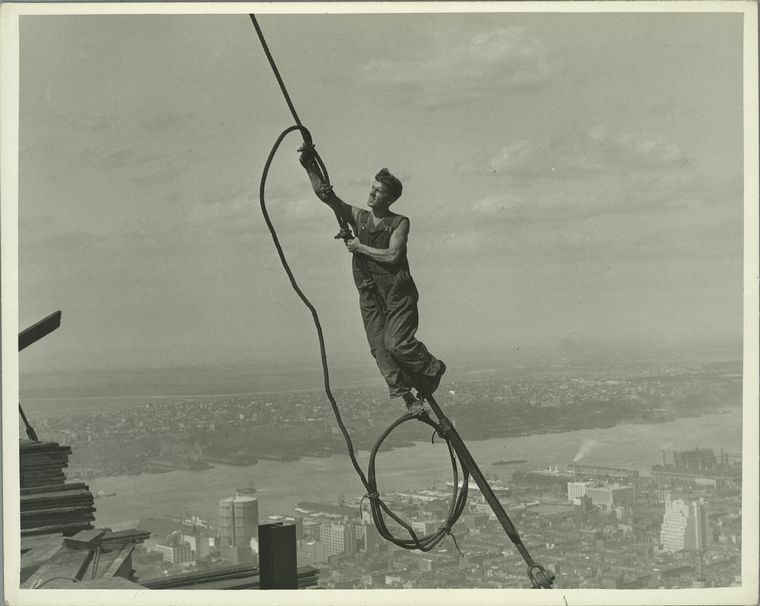 Caption: “Icarus, high up on Empire State” reveals a particularly brave worker in 1931. 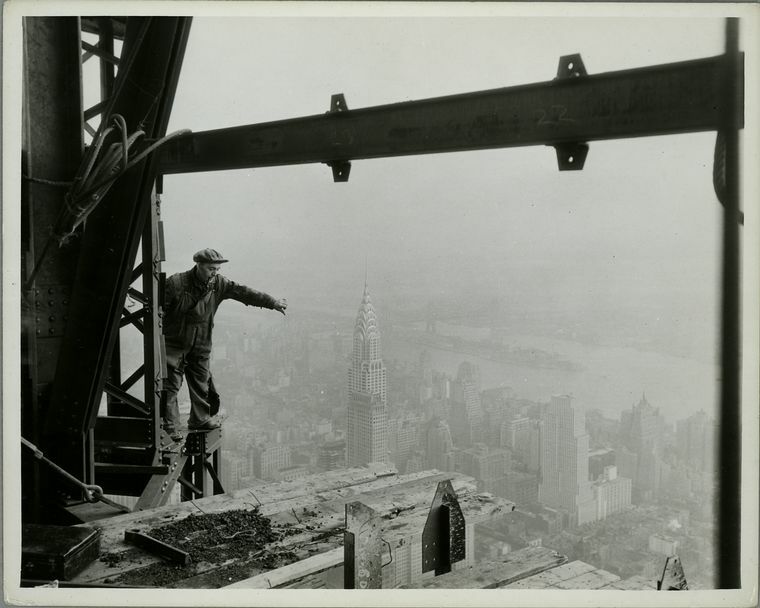 Caption: This picture from inside the construction shows the height of the Chrysler Building vs. Empire State Building. 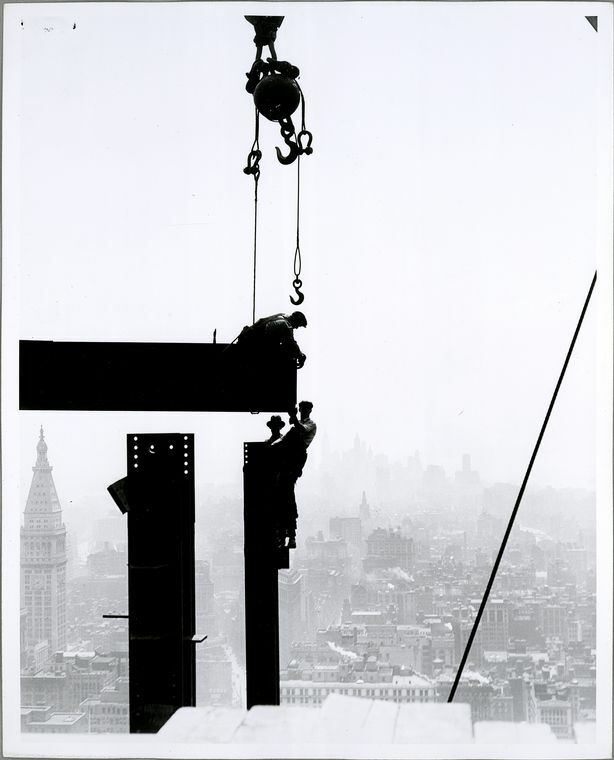 Caption: “Workers on the Empire State Building” are just hanging out, so to speak, in 1931. 1929-31: Workers plow through construction during the Great Depression with very little in the way of safety restrictions or equipment. Five workers died out of 3,400 laborers. It is built at a cost of nearly $41 million when factoring in land costs. How long did it take to build the Empire State Building? It took only 410 days to construct, at a frenetic rate of about four stories per week. Caption: The skyscraper is about three-quarters complete. 1931: The Empire State Building (ESB) officially opens on May 1. President Herbert Hoover presses a button in Washington, D.C., and turns on the building’s lights. 1933: Hollywood fame comes to the Empire State Building: Movie King Kong chooses the skyscraper as the place for its last stand between a giant gorilla and several airplanes. Caption: King Kong features a giant ape falling off of the Empire State Building after being attacked with planes, and the movie makes the building very popular with tourists. 1945: On a foggy summer morning, a B-25 bomber rerouted from LaGuardia Airport to Newark crashes into the Empire State Building. The plane crash kills 14 people. It also severs all of the lines holding up one of the elevators; a 20-year-old woman named Betty Lou Oliver survives a 75-story drop to the basement. 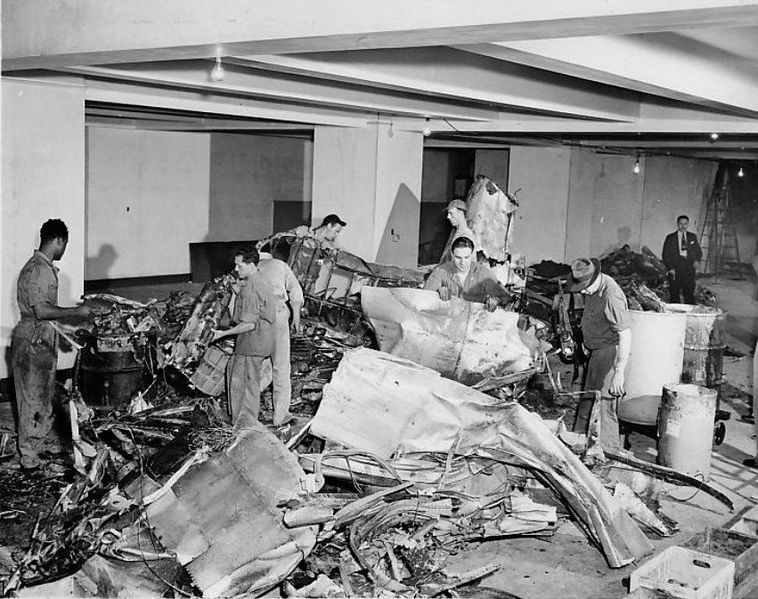 Caption: Workmen look through the wreckage of the B52 bomber that crashed into the 78th floor. Caption: This photo shows the hole on the 78th floor where the small plane crashed. 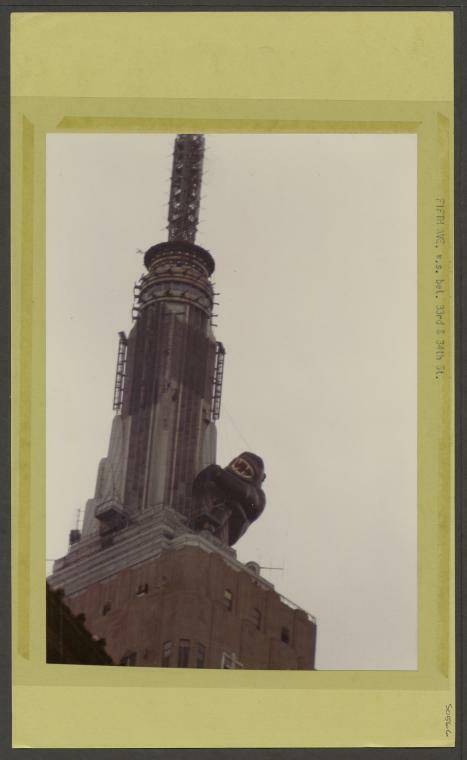 1950: A new 217-foot television tower is added, bringing the total Empire State Building height to 1,467 feet. 1950s: ESB “breaks even”; for the first time since its construction, the building begins to turn a profit. 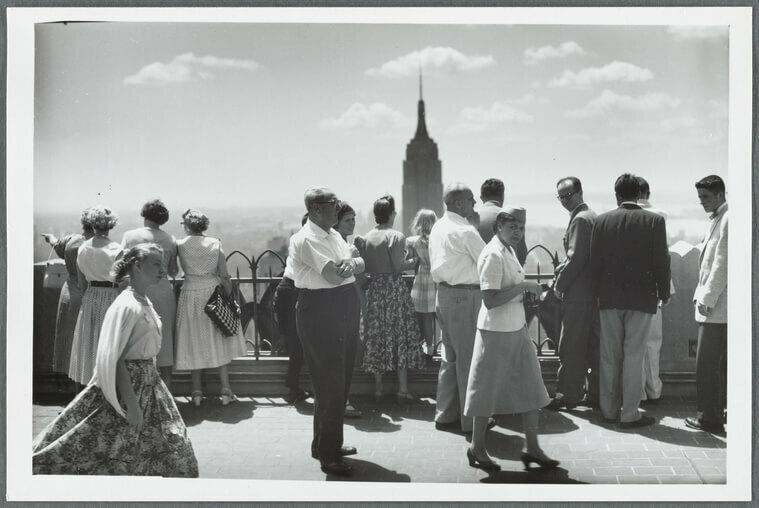 Caption: Tourists gaze at the Empire State Building view from Rockefeller Center in 1956. 1957: An Affair to Remember romanticizes the observation deck in a unique way, which is later imitated by the 1993 film Sleepless in Seattle. Since then, it has become one of America’s favorite places to propose, voted the #1 proposal spot by USA Today readers. Those who run the building even encourage this behavior, hiring a saxophonist to play during certain hours at the observatory. 1962: The Empire State Building gets a bath: Its exterior is cleaned for the first time since its opening. It takes a crew of 30 people six months. 1964: The now-famous colored floodlights on the upper stories of the building, which have since been used to herald everything from holidays to the announcement of a new M&Ms color, are introduced during the World’s Fair. They’re replaced with an LED system in 2012. 1970: For the first time in Empire State Building history, it is no longer considered the tallest building in the world. That title is surrendered to the newly constructed World Trade Center towers. 1977: The first-ever “run up” challenge, which is now an annual event involving hundreds of runners dashing up 86 flights of stairs, takes place. 1979: An unfortunate “tradition” involves New Yorkers dying by suicide by jumping off of the building, but in this year, a suicide attempt is luckily thwarted by the wind. After losing her job, Elvita Adams tosses herself off of the observation deck, but a chance gust of wind blows her back onto the ledge of the 85th floor. Today, steps have been taken to prevent suicides there, including adding barriers and more security, but another important prevention measure is the national hotline introduced in 2004. Adams didn’t have this resource, but modern people do: 1-800-273-8255 (1-800-273-TALK). 1983: To commemorate the 50th anniversary of King Kong, enthusiastic and eccentric New Yorkers attempt to create and deflate a giant, inflatable King Kong atop the building. The inflatable didn’t work properly, but they got a lot of press attention anyway. Caption: King Kong returns to New York in 1986. 1986: Two daredevils illegally jump from the observation deck with parachutes but are later arrested. Several more parachute jump attempts have occurred and been thwarted since. 1986: Also in this year, the building is recognized officially as a National Historic Landmark by the National Park Service. 2001: After the 9/11 attacks level the World Trade Center, the Empire State Building becomes the tallest building in the city once again. Caption: The 9/11 attacks change the entire skyline of NYC. 2007: America votes for the ESB as “America’s Favorite Architecture” in a poll by the American Institute of Architects. 2008: The New York Daily News demonstrates how easy it is to transfer the deed of the Empire State Building from its established trust by temporarily “stealing” it. 2011: The skyscraper goes green; the building earns a gold LEED certification after implementing more energy-efficient upgrades. 2011: In a Cornell study of Flickr photos, the building is deemed not only the most photographed landmark in NYC but one of the most photographed landmarks in the world. 2012: One World Trade Center is built, bumping the ESB off its throne as tallest building in the city once again. Caption: The Empire State Building has made some new friends. New Yorkers love the Empire State Building so much that they tend to get fairly upset whenever a new skyscraper crowds their view of it. But growth is inevitable. The MetLife Building (then called the Pan Am Building) was likely the first to get this kind of enthusiastic hate, since the gaudy 1970s design blocked the nearby Chrysler Building. Much more recently, however, New Yorkers have to contend with fairly homogeneous new super-skyscrapers (including many of the new Hudson Yards buildings and 3 Manhattan West) sprouting up around the beloved Empire State Building. In Brooklyn, in Manhattan, and even in New Jersey, locals have been raging about this overcrowding: People love their Empire State Building and don’t want it to be blocked by less beautiful, “delicate” buildings. Whether good or bad, change in NYC is a constant. 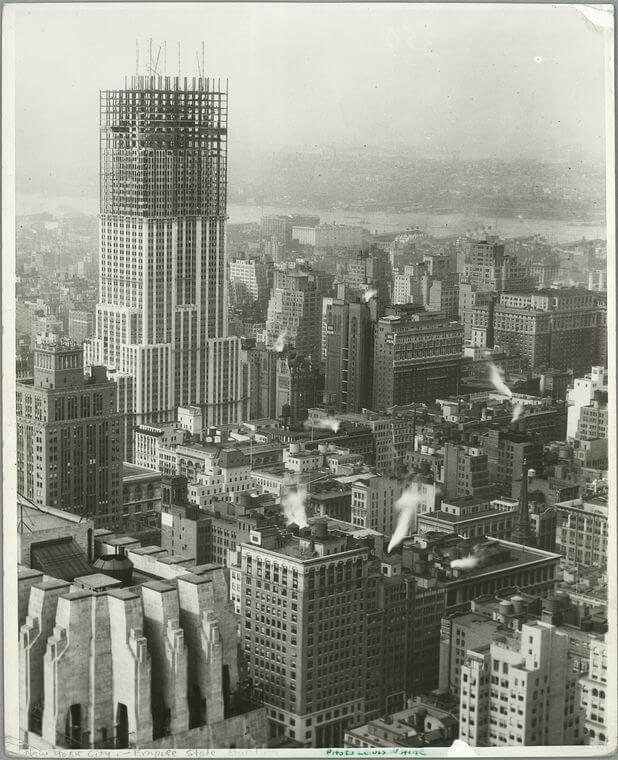 After all, the initial building of the Empire State Building during the Great Depression came with complaints, too, and now, it’s hard to imagine NYC without it.